In a career that spans over four decades, garage rock superheroes The Fleshtones truly have done it all. They’re one of the final remaining original CBGB bands, they’ve played on Andy Warhol’s short-lived MTV show while Sir Ian McKellen read Shakespeare over their jamming, and were the last band to publicly perform at the World Trade Center’s Windows on the World. However, what’s most incredible about The Fleshtones is that they’re putting out some of their best music yet forty years into their career, as evidenced by their brand new limited edition 45 single Layin’ Pipe b/w Lady Nightshade. “Layin’ Pipe” is a cover of the great Canadian blues rocker David Wilcox, but the track gets a garage rock facelift from The Fleshtones, complete with howls from Keith Streng and a leading vocal performance by “The Count” Peter Zaremba. “Lady Nightshade” is a rollicking original by The Fleshtones, featuring some haunting guitars licks and various spellbinding chants throughout the chorus. The Fleshtones are rocking harder than ever before, and these two tracks deserve to be played at the loudest volume possible. Limited to 750 copies worldwide. The video for “Layin’ Pipe” premiered today at Brooklyn Vegan! 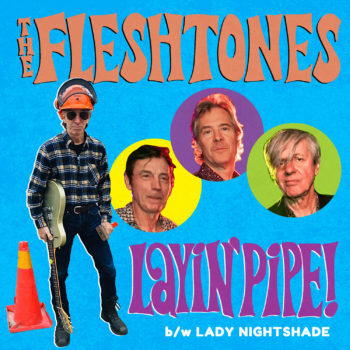 Pre-order your copy o The Fleshtones’ Layin’ Pipe / Lady Nightshade here! Save 20% on Tony Joe White Releases through 4/19! Yep Roc Announces 2019 Record Store Day Titles!